Please note: David has left the Mathematics department at Duke University; some info here might not be up to date. Tuesdays, 1pm - 3pm, Thursdays, 2pm - 4pm, and by appointment. Ph.D. in Mathematics, Duke University, September 2005 M.A. in Mathematics, Duke University, December 2001 B.A. in Mathematics, University of Virginia, May 2000. 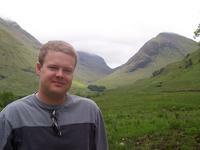 Research Interests: Stochastic Differential Equations related to biochemical reaction systems. There are two different natural contexts in which stochastic dynamics arises in the study of biochemical reaction networks. In the first, the stochastic chemical dynamics arises from the randomness inherent in the formation and breaking of chemical bonds. This is the randomness present in the Gillespie algorithm. If one scales up the volume and number of molecules while keeping the initial concentrations constant, then this intrinsic stochasticity becomes negligible on the scale of concentrations and the dynamical system reduces to a collection of deterministic, coupled differential equations. The second type of stochasticity, which is the focus of my study, arises naturally in this scaling limit. In this second context, one wants to investigate the response to external excitation of a biochemical system (whose dynamics are well described by differential equations). Here the randomness is a tool used to study the out-of-equilibrium dynamics of the biochemical system and the object of study is a set of differential equations that is forced by a continuous stochastic process in one or a small number of components. I take two distinct approaches in my study of stochastically forced biochemical systems. In the first I study how fluctuations propagate through relatively simple systems and study the effect of network topology on the emergent properties of the reaction system. In the second, I apply fluctuations to in silico representations of specific biological networks.